BCA is back at it again with our new Think Before You Pink® campaign for 2009. As with past campaigns, this year we’re identifying another pinkwasher. We coined the term “pinkwashing” several years ago to help us identify companies that claim to care about breast cancer but profit from the sale of products linked to the disease. General Mills to use rBGH-free milk for Yoplait, and Dannon followed suit shortly after. This victory eliminated rBGH-stimulated milk from two-thirds of the U.S. dairy market. But as long as rBGH is manufactured, we remain at risk, because rBGH-stimulated milk does not require special labeling. In fact, in some states labeling a product as rBGH-free is prohibited. The best way to eliminate this risk is to go to rBGH’s source, and make one simple demand: Eli Lilly and Company must stop manufacturing rBGH. In the fall of 2008, Eli Lilly bought the exclusive rights to rBGH (marketed as Posilac) from Monsanto. Eli Lilly is now the sole worldwide producer of rBGH, which it manufactures under the subsidiary Elanco Animal Health. Also known as recombinant bovine somatotropin, or rBST, rBGH is injected into cattle to make them lactate longer and produce more milk. The milk from cows injected with rBGH contains elevated levels of a protein that is suspected to increase women’s risk of breast cancer. rBGH is no stranger to controversy. It was approved by the FDA after only 90 days of animal testing, and the studies conducted to obtain approval for rBGH made claims that are contentious in the scientific community. Newer research suggests that the protein in rBGH-stimulated milk is linked to breast cancer. Unfortunately, companies with an investment in the artificial hormone continue to rely on incomplete and outdated studies. This puts the onus on consumers to demand that companies put healthy food before profits. The health risks associated with rBGH are not limited to breast cancer. Use of antibiotics in the dairy industry contributes to the growth of antibiotic-resistant bacteria and has increased mastitis (bacterial udder infections) in cows by 25 percent. These infections must be treated with antibiotics and therefore increase the problem of antibiotic resistance in farm-borne pathogens. These bacteria find their way into our food, milk, air, soil, and water, and can cause major health problems for humans. In addition to the breast cancer–linked rGBH, Eli Lilly manufactures Gemzar, a drug that is used in the treatment of metastatic breast cancer. It also manufactures Evista (raloxifene), a drug that it claims to reduce the risk of breast cancer in individuals with high risk factors. In 2005 Eli Lilly was fined $36 million for illegally promoting Evista to doctors as a breast cancer preventative treatment, though the drug was not then approved for this use. As its efforts to promote Evista demonstrate, Eli Lilly is prepared to go above and beyond regulations to wring profits out of its products. Essentially, Eli Lilly is milking the breast cancer market for all it’s worth. It offers women the options of “preventative” medication as well as treatment drugs to combat a problem it perpetuates by tainting the U.S. dairy supply with a potentially cancer-causing hormone. This perfect profit circle makes a lot of money for the pharmaceutical giant. Eli Lilly claims that it is “rooted in a culture that values honesty and caring for [its] community,” but it risks consumers’ health by manufacturing and marketing rBGH. The continued production of an unnecessary artificial stimulant that is linked to breast cancer flies in the face of a self-proclaimed Eli Lilly core value. Unless, of course, such a value is just a public relations tactic. Breast Cancer Action supports a standard of regulation known as the precautionary principle, which states that when a product raises threats of serious or irreversible harm to human health or the environment, it should be banned, even if the cause-and-effect relationship of the potential harm is not fully established. Breast Cancer Action believes that chemicals or additives should be proven safe before they are allowed into the marketplace. We should not wait until a product is proven to be toxic and has been on the market long enough for damage to become evident before banning it. Concern over the health effects of rBGH has caused it to be banned in Australia, Canada, Japan, and all 27 countries of the European Union. We consider this, along with the studies that question its health safety, to be evidence enough. Many U.S. companies choose to provide rBGH-free milk because of consumer concern over the potential harm it poses, including large corporations like Kroger, Starbucks, and Wal-Mart. Regulatory agencies in other countries and private companies in the United States acknowledge the risk of rBGH-stimulated milk, but Eli Lilly continues to produce this cancer-linked hormone. Those who do not have access to alternative sources of dairy products are forced to be a part of Lilly’s profit cycle. This includes our children. Many public schools are forced to purchase rBGH dairy—food contracts simply don’t include an rBGH-free dairy option. But Americans who can afford organic foods can buy rBGH-free dairy. Across the U.S., families are rejecting rBGH tainted milk. Yet Eli Lilly continues to manufacture it. Again, is this really the way a company behaves when it is truly “rooted in a culture that values honesty and caring for [their] community”? It seems to us that this is the behavior of a company out to make as much money as it can, regardless of the consequences to the global community’s health. BCA encourages everyone to join us in asking Eli Lilly to stop milking cancer. BCA has already sent a letter to Eli Lilly, calling for an end to its shameless breast cancer profit cycle by stopping the production of rBGH. Now we are asking you to do the same. Visit www.milkingcancer.org to learn more about Eli Lilly’s harmful profit cycle. 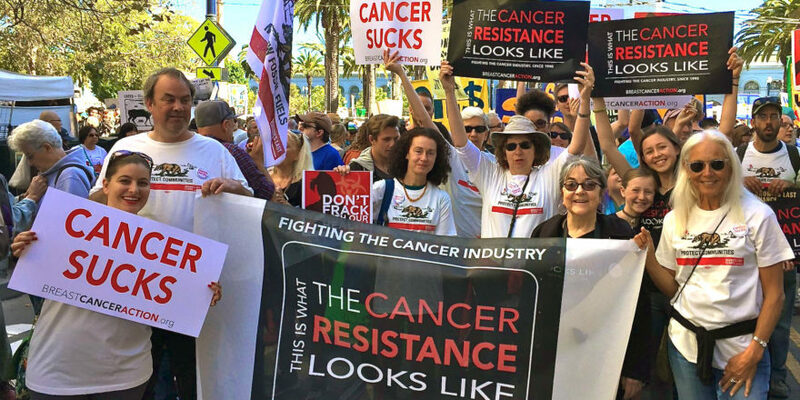 Join with us to fight Eli Lilly’s greed for profit at the expense of your health by sending a letter to the company demanding it stop milking cancer. Help us put pressure on Eli Lilly by mailing or e-mailing to ask the company to stop manufacturing this chemical. For further information on how to accomplish this and other ways to support the “Eli Lilly: Milking Cancer” campaign, please visit our web site, www.milkingcancer.org. We at BCA cannot stress enough how important supporter participation is to our campaign work—your contribution really can make a difference to inspire change with BCA. Together, we can achieve an rBGH-free world. Kimberly Bormann and Alice Price-Styles are student interns who worked at BCA in 2009.